There are two different options offered by Frogs Rafting for the Dranse: the classic and the pro. Owing to my apparent fear of rocks and lack of previous experience, we chose the classic. Our guide Jeremy broke the ice (or at least the water) straight away by encouraging us to jump into the chilly river. 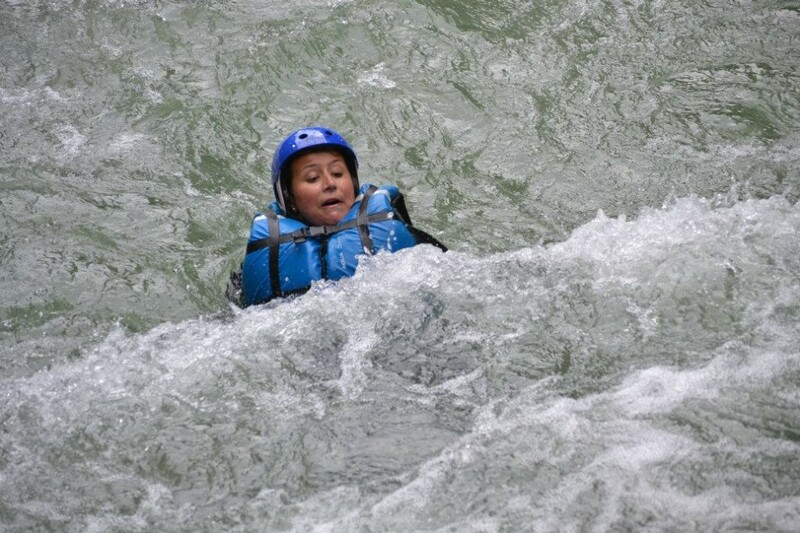 There couldn’t have been a better way to conquer everyone’s fear of falling in and to realise how protective the wetsuits were to the water, which was around 10 degrees when we went in. Clockwise paddle makes you go forward, anti-clockwise puts you in reverse…it all sounds so simple but it’s surprising how easy it is to get confused…or that could have just been me! There’s plenty of time to get your bearings though so don’t worry if, like me, you struggle with co-ordination. The route we took is the perfect mixture of rough and smooth, allowing enough time to recover from the trickier rock sections for a first timer. The calmer parts of the river not only allow time for a little recuperation but were also filled with interesting geographical and wildlife facts by Jeremy. During these sections it is also possible to notch up some adrenaline points by completing jumps from various points along the riverside. The buzz of diving into the crystal cold and fresh water is so refreshing and gets you ready for each new section of rapids. There was even opportunities on the smoother sections for us to take it in turns trying our hand at steering the boat. It really is surprisingly hard work and I think everyone was quick to realise this when we ended up on top of a pile of rocks in the middle of the river…stuck fast. Luckily it was all in the fun of the day and after much easing and teasing, we left the rocks and were free to float down to our end destination. It was a truly exhilarating and stimulating day that everyone was sad to see end but keen to do again. 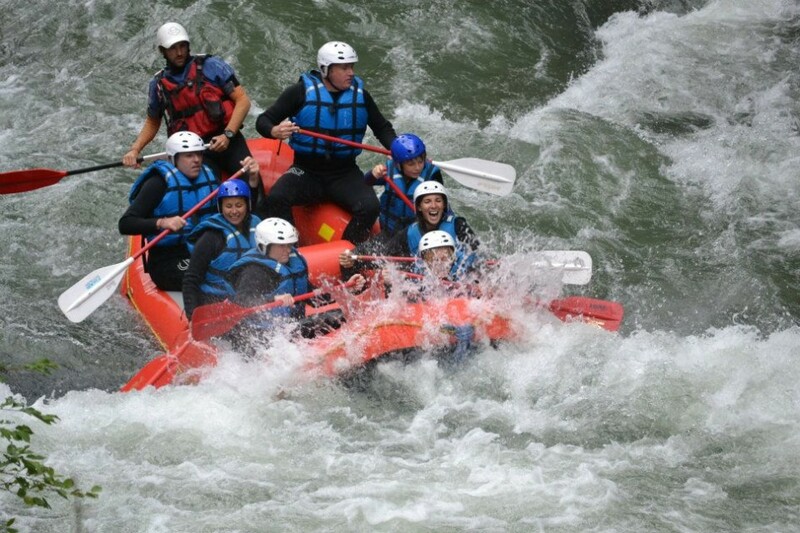 One of the best elements of white water rafting has to be its versatility as a holiday activity. Unlike the majority of activities, the weather doesn’t create any constraints. On a sunny day, the river sparkles crystal blue and jumping into the icy waters can be a refreshing relief. Alternately, rainy days cause the river to rise making the whole experience swifter and more exciting. Who cares that it’s raining when you’re already soaking wet? 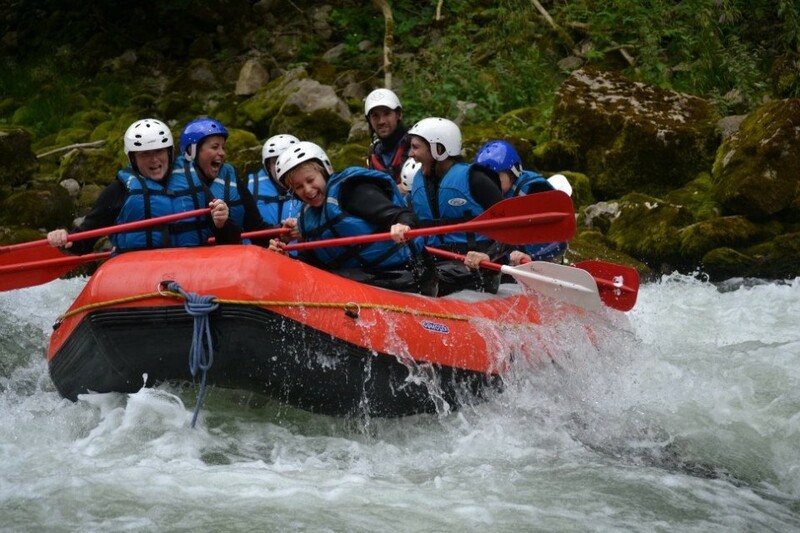 For more information on rafting while you are visiting Morzine, you can visit their website.